Learn how facilities retrofit their CR rooms to DR. The advantages of DR over CR have long been known in the medical imaging industry—the technology is more efficient, quicker, and, most importantly, requires less dose to the patient. That's why many hospitals and health care facilities have either switched their CR rooms to DR or are contemplating the change. A facility still relying on CR that wants to make the transition must decide whether to make the move one room at a time or in one swoop. In addition, departments need to figure out how the integration should be implemented. Cheryl McCarron, Carestream's regional business manager for X-ray solutions, notes that providers converting from CR to DR must assess their workflow and imaging needs. "Because DR systems can provide both higher image quality and faster image access, converting to DR will increase productivity," McCarron says. "Our imaging consultants help providers determine which DR systems are appropriate for their current and future imaging needs. As we examine the improved digital workflow, we often advise providers they can convert CR rooms to another modality or purpose due to the efficiency offered by digital radiography." When evaluating whether to convert to DR, McCarron says radiology managers should consider the age of each existing X-ray system, its current operating condition, and whether it provides all the necessary imaging capabilities. "In some cases, the X-ray imaging system may need to be updated to deliver advanced features or enhanced productivity," she says. "And in other cases, installing a DR detector can deliver a rapid conversion to DR technology that makes high-quality images available in seconds." Richard Harold Strauss, director of group purchasing organization/integrated delivery network sales and health care marketing at Virtual Imaging Inc, a Canon company, notes that the first step in working with a health care facility involves sitting with the director of radiology to get a better understanding of how any particular room is utilized, asking vital questions such as, "What's the workflow into the room?" and "Is it heavy in the morning; is it light in the afternoon?" "What they're trying to determine is the correct methodology to go from CR to DR," Strauss says. "Is the room capable of making that transition? Is it the right vintage and age, or do you really need to look at replacing the entire room?" If an original equipment manufacturer is doing the job correctly, it should really be acting as more of a consultant than playing a sales role with the customer. After all, there are many ways to go from CR to DR, and deciding what's best to meet the needs of the facility will establish a strong, long-lasting relationship. The make, model, and age of the equipment will also play a role in the decision to upgrade or do a full-room makeover. "If it's determined that the room is too old—somewhere in the 20- to 25-year neighborhood or older—then you should have a conversation about a total-room upgrade," Strauss says. "That can be a costly endeavor for the facility, but it's not always necessary. If it's not too old, you don't need to go that route." Some of the facilities Canon has recently worked with began by conducting a room-by-room survey, noting the age of the equipment, the status of the hospital's IT system, and the type of radio frequencies that may cause interference if the department chose to use an automatic exposure solution. 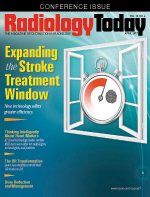 "Each room has to be thoroughly vetted before a bona fide solution is presented to the radiology manager," Strauss says. George Curley, Agfa Healthcare's senior marketing manager, says all customers regardless of size are evaluating how soon and how best to comply with the Consolidated Appropriations Act, in order to maximize their Medicare reimbursements, which are in the process of changing. Agfa Healthcare offers a program called Fast Forward to DR, designed to help customers make the transition from film to DR or CR to DR. While the migration has been ongoing for approximately six years, Curley notes that changes in Medicare reimbursements are likely to accelerate the process, adding that effects will vary among facilities. "There's been a lot of analysis this year and shifts toward getting rooms upgraded and maybe a DR retrofit scenario or replacement," Curley says. "There are several ways to justify it, and we help our customers with that. Sometimes it could be just a room replacement, because it's on its last legs or they need to upgrade their service for the patients they take care of. Other times, it's just retrofitting an existing room or adding mobile radiology." In the case of a mobile replacement, setup generally involves getting the DR system hooked up on the hospital's Wi-Fi and PACS. The mobile transition can take one of two forms: a new unit with an onboard computer and digital detectors or a retrofitted analogue mobile unit. "With CR, generally the technologists have to carry the plates to the ICU and back, and in a small facility that might not be very far, but in a big facility that could be 20 to 30 minutes before they get a radiograph," Curley says. "We will generally get it on the network with the portables and it makes it much less time consuming." Agfa Healthcare's retrofits involve installing a panel and upgrading PCs to handle the digital detector, which can run both CR and DR. A couple of days of application follow. "The more complex solution is the room replacement, although the steps are not all that different when it comes to installation," Curley says. "Generally, you have to have old hardware removed, many customers have to do site construction or reconstruction, and then the new equipment is put in." Opting for a full-room upgrade is the most expensive, labor-intensive, and time-consuming proposition for a facility. Industry insiders say the project can cost anywhere from $200,000 to $450,000 and necessitate the room being down for up to two weeks. In addition, staff must be trained on how to utilize the room. "The most important thing is to work with a company that offers multiple options," Strauss says. "If you talk to most radiology directors, their first choice would be to upgrade an entire room. But that's the most costly option and sometimes not practical." According to Strauss, there are three ways to upgrade an existing room to DR: a full-room replacement, which is the most expensive; integrating a tethered DR panel with the existing generator; and equipping a wireless DR detector with the latest auto-detect technology. "Our DR tablet solution comprises a tablet, a Canon CXDI Wireless DR Detector, and the CXDI Control Software NE. This solution can be implemented in a couple of hours, because all that involves is replacing the CR plates with a DR plate and then hooking into the hospital's IT system," he says. "I've seen rooms converted this way in literally 20 minutes in the low $50,000 to $55,000 range." Curley says delivery on retrofits and portables vary between two weeks and two months, with rooms often requiring as much as six months of preparation. "Quality retrofits on our size may be as low as $40,000 all the way up to $350,000 or so with new room installations depending on all the details," Curley says. "Budgetwise, I would say the trend of detectors and panels and the digital element that captures the image has come down pretty rapidly over the last three years. The cost of replacement on all three scenarios has dropped a great deal." Carestream imaging specialists work closely with facilities to maximize the utilization of DR detectors and figure out the best method and price. The company can convert a room from CR to DR in about four hours, according to McCarron. Its mobile retrofit kits use a single wireless detector to convert a facility's existing mobile X-ray equipment—regardless of supplier—to a DR system. "Implementing a DR detector is an affordable way to extend a provider's return on investment," McCarron says. "If the existing X-ray room is older or offers limited functionality, providers can keep the DR detector and use it with a new X-ray room." In some cases, facilities may convert one CR room to DR and keep another CR room for backup. McCarron says Carestream registers detectors for use with multiple imaging systems and specialists help radiology managers maximize detector use. For example, a detector may be deployed in a mobile imaging system that conducts early morning bedside exams and then moved to a room to image patients during the day. A detector can also be shared between two X-ray rooms. Many health care facilities are gravitating toward making the switch to DR, although there is a groundswell in the industry for multifunctional rooms that accommodate not only DR but also digital fluoroscopy and other clinical procedures involving specialists outside of radiology, such as gastrointestinal labs, pain management, and orthopedics. "We are seeing this trend start to develop, and while it's early in the lifecycle, it's something that customers are starting to inquire about," Curley says. "Nobody has money to burn in health care, but there are a lot of advantages to moving to DR, and productivity gains, which will improve patient and staff satisfaction, are not insignificant."